Watermelon. Raspberries. Zucchini. Tomatoes. Summer’s gardens are a veritable bounty of mouth-watering fruits and vegetables, bursting with flavor and nutrients. But now that we can get these foods year-round, why should we bother stocking up on them now? Eating seasonally is one of the pillars of designing a healthy diet, and for good reason. Nature provides the nutrients we need exactly when we need them to ensure optimal health. Before we were able to enjoy peaches in February, we had a very limited time to indulge in these delicious sweets. And guess what? We didn’t suffer as many preventable health problems as we do today. Perhaps that’s because most of our summer foods do an excellent job of preparing us for winter. Chock-full of vitamins, minerals, and phytonutrients, these fruits & veggies exert potent antioxidant power to get our immune systems in tip-top shape and protect our cardiovascular systems. The complex carbohydrates so plentiful in summer used to help fatten us up for impending fall & winter, when we were forced to rely on limited amounts of wild game, root vegetables, nuts, seeds, and traditional storage techniques (root cellars, pickling, canning and iceboxes). In-season foods improve health because they have more nutrients. Many vitamins and phytonutrients are denatured with exposure to oxygen, light or heat. 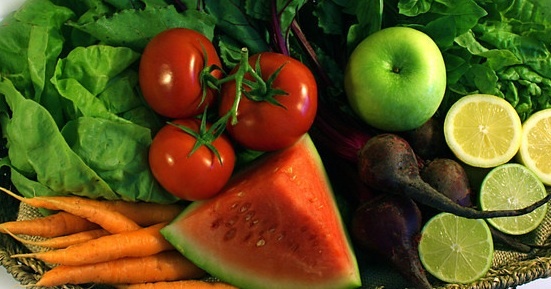 So the longer you have to wait to eat a vegetable after it’s been picked, the fewer nutrients it offers. One of the benefits of eating seasonal produce is that it can be grown & sold locally, which cuts down the time between harvest & a fresh salad on your plate. And many local growers choose not to use harmful pesticides, so even non-organic seasonal foods can be safer. Plus, as anyone who has ever tried to eat a tomato or avocado out-of-season can tell you, the taste of fresh produce is beyond compare. Seasonal foods also provide a perfect counterpoint to the climate. When it’s hot out, a big sweet potato or winter squash just isn’t appealing. But berries, cucumbers, and mint? Bring it on! Besides being a healthy way to eat, eating seasonally is usually less expensive. Take watermelons, for example. Watermelons can be grown nearly anywhere in the summertime, but if your craving occurs in winter, your watermelon will likely be shipped in from a warmer locale. Shipping requires fuel, and we all know how expensive that is nowadays! In addition, foods grow well when they’re in season, so there is a greater supply available, which also drives the price down. Affordable, healthy & better-tasting? Sounds like three great reasons to dive into summer produce with abandon. Enjoy!